The Royal Australian Navy required a device to safely retrieve and move explosive mines from the seabed. Conventional recovery systems are unsuitable because they are limited in the weights they lift and the depths at which they operate. The operations are also too dangerous for clearance divers. Inflatable lifting bags are a safer option, however the RAN required one that was more reliable and economical than those on the market at the time. 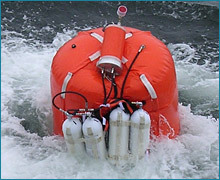 Local company Liferaft Systems Australia was approached to design a new underwater inflatable lift bag. LSA designed and manufactured the bag, however, required an inflation device that was suitable for Defence applications. Fiomarine’s economical two-way acoustic communication system provided an ideal inflation device as it met Defence specifications and was a trusted and proven system. Fiomarine was also able to ensure the Fio GMS1000 was built with a minimum magnetic signature and without the use of explosive squib, features that are essential when dealing with explosives such as mines. With Fiomarine’s Fio GMS1000, LSA was able to manufacture the Cormorant Lift Bag (CLB) for the RAN at almost half the price as others on the market. The project was also delivered to the RAN on time and under budget. Learn more about the CLB here on LSA’s website. Think the Fio GMS1000 will suit your underwater recoveries? Ask us in an enquiry form.